The Specials grace the cover of the current Vive Le Rock magazine which claims "New Album Exclusive!" in big red type. Though I have not been able to get my hands on a copy, from what I can gather, the 4-page feature includes interviews with the band about the Tories and about their experiences touring. There is a separate side-bar article where Jamie Jazz from ska/reggae/folk trio The King Blues interviews guitarist Roddy Radiation. What's of most interest though is that nagging cover claim, which seems to be an on-again and off-again story/rumor that has chased the band since the reunion kicked off in 2009. It tends to get the band's fans overheated and excited for a time (myself included) and then the band tend to put the rumor to rest. In this case, it seems that the magazine has taken liberties with what band members may have said in the context of the interviews. I imagine one or more of the band members mentioned they were writing songs (and given Roddy and Neville have their own band's that is a a true statement). That tantalizig possibility of new songs makes great copy and helps to sell copies (though the band is about to sell out all the venues of their final European and UK tours so the publicity is just that -- publicity). In this case the publicity would seem to benefit Vive Le Rock. 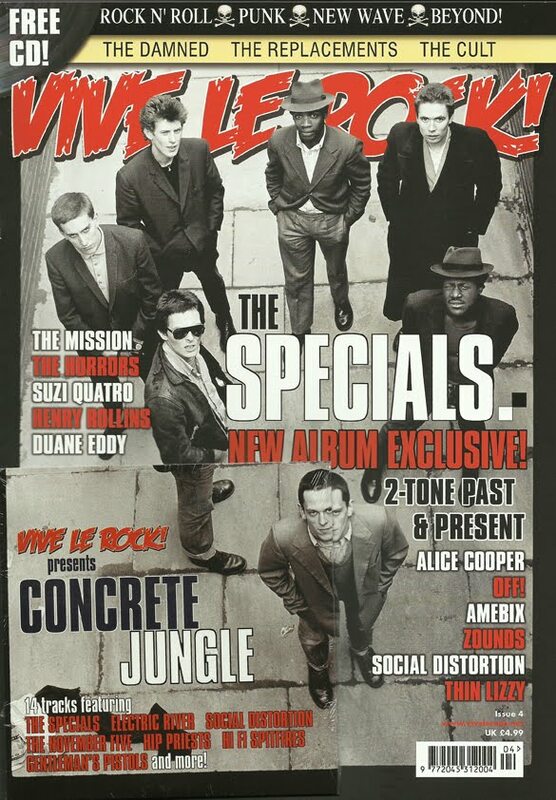 Re our current Specials cover feature, Vive Le Rock would like to point out that the band have not actually said they will release a new album together, they merely said that they are all writing songs, but whether it is suitable for the Specials or not is another matter. They said they have not made that decision yet. We perhaps got a little carried away, hoping for a new album. It does however, look to be their final tour, but as one door closes, another door opens. You have not heard the last of the Specials by any means. Its all in this month's Vive Le Rock magazine. If anyone has a link or a scan of the story or can share more about the contents to the story I would love to see it. Barnes and Noble usually carries Vive Le Rock (though I was there last night and it wasn't in yet). I expect this is really just the magazine hyping the possibility of new music in order to sell copies. Having said that, I have read previous issues of this magazine and it's pretty good (and a lot like MOJO). If you want a copy of the magazine sending over from here in the UK, PM me with your details. I enjoy reading your blog, so it's the least I can do. Besides, us bass players gotta stick together!